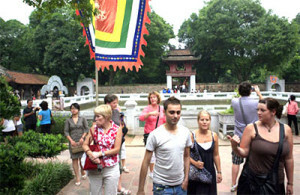 Hanoi welcomed 4.87 million domestic tourists and 705,000 foreign arrivals in the first quarter of 2014, up 8 percent and 15 percent respectively from the same period last year. In addition to upgrading facilities, the city is also developing new tourism products to attract visitors, such as marionette shows and cheo singing (Vietnamese opera) performances. Hanoi has invested in improving the quality of infrastructure and services at its cultural heritage sites, including Ngoc Son Temple, Van Mieu (Temple of Literature) and Hoa Lo prison. The city plans to develop the Ba Vi – Suoi Hai complex in its outskirts district of Ba Vi into a national-level tourism site and promote community-based tourism in the district’s mountainous communes. It is also working on the building of a centre to introduce visitors to Viet Nam’s traditional trade villages. Attention has also been paid to strengthening cooperation with other localities nationwide and participating in international tourism fairs to promote the city’s image. This year, the capital city strives to attract 2.8 million foreigners and 16 million tourists from other localities nationwide, and earn 45 trillion VND (2.1 billion USD).